The commemorations featured in the closing ceremony of Exercise Safkar Indopura. On November 20, the armies of Indonesia and Singapore commemorated 50 years of bilateral relations at the closing ceremony of a bilateral exercise. The celebrations once again put the spotlight on the ongoing anniversary of the relationship as well as the continued defense ties both countries continue to maintain in spite of remaining challenges. As I have pointed out before in these pages, the security relationship between Indonesia, Southeast Asia’s largest state, and Singapore, the subregion’s smallest, has tended to be prickly historically speaking. It took nearly a year for Indonesia to even officially recognize Singapore’s independence from Malaysia following Jakarta’s violent opposition to the creation of Malaysia, known as Konfrontasi. Over the past few years, disagreements have tended to simmer from time to time, whether around traditional issues such as air space or non-traditional security matters like the annual haze problem, even as both sides have tried to manage differences (See: “Historic Indonesia-Singapore Maritime Boundary Pact Goes to UN”). Nonetheless, the two countries have still maintained a cordial defense relationship that includes the usual components, including visits, exchanges, and exercises, and some of these have been in the spotlight this year more so than usual as both sides commemorate the 50th anniversary of their relationship this year, which is being marked with the tagline of “RISING 50” (“RI” for the Republic of Indonesia, and “SING” for Singapore). One of the interactions between the two sides is Exercise Safkar Indopura, the flagship annual exercise between infantries from both armies first held back in 1989. On November 13, the two sides kicked off the 29th iteration of the exercise, which will officially last through November 24. The exercise featured various interactions including urban operations training, live-firing, a planning exercise, and the conduct of a combined battalion field exercise. 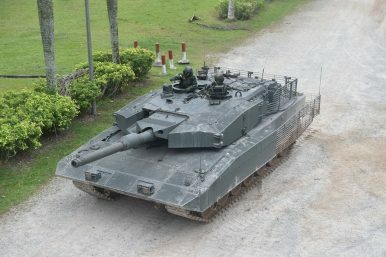 It also saw for the first time the joint operation of the Leopard 2SG Main Battle Tank by soldiers from both armies in what was considered an expansion of the bilateral exchange between them. Around 300 personnel from Singapore and 170 personnel from Indonesia participated in the exercise, according to Singapore’s defense ministry (MINDEF). Both sides also commemorated the 50th anniversary of bilateral relations at the closing ceremony of the exercise on November 20, MINDEF said in a statement. The ceremony, which was co-officiated by the army chiefs from both countries, saw personnel from the two armies forming the number “50” on parade. They had also been set to execute a combined jump into the Murai Urban Training Facility during the closing ceremony as well. A recent exercise highlighted ongoing efforts by both sides to boost the level of activity in the defense realm.